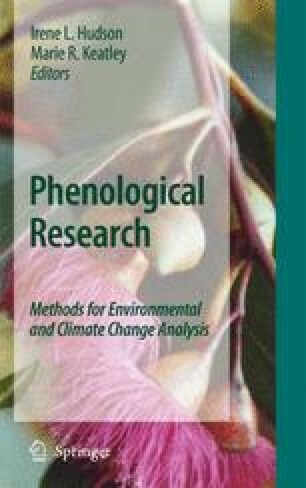 This chapter discusses singular spectrum analysis (SSA) and uses a 32 year record (1940–1971) of flowering of four eucalypt species (Eucalyptus leucoxylon, E. microcarpa, E. tricarpa and E. polyanthemos) to illustrate its use. SSA delineated the trend, annual and biennial cycle in all four species. Additionally a 4 year cycle was detected in E. tricarpa. The trend and annual cycle were identified by SSA decomposition of the underlying climate profile (rainfall and mean, minimum, maximum temperatures). An examination of the correlation between the reconstructed flowering series and lagged climatic components found that for E. leucoxylon and E. tricarpa there was a similar relationship to climate. These two species exhibit a significant negative relationship with the temperature variables and a positive relationship with rainfall. The strongest relationship for E. leucoxylon was with minimum temperature (ρ = –0.742). In E. tricarpa maximum temperature was the marginally stronger driver (ρ = –0.895). Both E. microcarpa and E. polyanthemos also share a similar relationship to climate but this differs to that of E. leucoxylon and E. tricarpa; in that these species were positively influenced at flowering by temperature and negatively by rainfall. For E. microcarpa minimum temperature is the main but weak influence (ρ = 0.383) and E. polyanthemos maximum temperature is the stronger influence (ρ = 0.674). We thank D Kupke, Hypatia Scholarship student in the School of Mathematics and Statistics, University of South Australia, for valuable editorial assistance in 2008 regarding the mathematical exposition. We also acknowledge the preliminary work of C Li in 2003, Honours student to Irene Hudson, at the University of Canterbury, Department of Mathematics and Statistics, Christchurch, New Zealand. Li’s Honours project “SSA – Theory and Application to Economic Time Series” inspired all our SSA ventures! Our work using SSA on eucalypts was started by K. Fukuda whose summer pilot project work in 2003 led to the joint presentation at the XXIInd International Biometric Conference: Hudson IL, Fukuda K, Keatley MR (2004) Detecting underlying time series structures and change points within a phenological dataset using SSA.